One of the great things about being a kid is that you get to constantly ask Why? even when you know the answer. Why is it so? But why? Why? etc as any parent will attest. The adult version of this is being a philosopher but still being able to ask the same question, Why? So if you’ll indulge my philosophical tendencies, I want to ask you why? At this festive time of the year many people attend functions with people they have never met. Sooner or later the conversation turns to ‘So what do you do?’. To which we all provide the standard ‘resume’ answer. Like a good philosopher I like to ask why? rather than what? So here’s my question. Why do you do what you do? Why do you work? Why do you get up in the morning? Try this experiment yourself. Ask people why they do what they do. I’ll bet you get one of three answers in the following percentages. 70% of respondents will simply say ‘I don’t know’. Amazing eh? They are doing something everyday (like working) but they can’t tell you why they are doing it. This is kind of like using a map without knowing the destination isn’t it? It kinda makes the map useless doesn’t it? 20% of respondents will say they want a ‘better’ this or ‘more’ of that, etc. This is certainly a more focused answer but notice how words like ‘better’ and ‘more’ are very vague. ‘Better’ than what? How much ‘more’? They are vague because people are afraid to set definitive goals because if they do they run the risk of failure. It is much easier to be vague because if you fail you can cover it up by saying ‘well we did more’ or ‘we actually did better’ even if that is not the case. The last 10% of respondents will tell you with great details why they do what they do. For example, they may say they are saving to buy a purple Bell Jet Ranger helicopter so they can learn how to fly and use it every weekend. You see the difference? A very definitive goal. There are some major benefits of setting very specific goals as well. The first is measurement. If you say you want ‘more’ money how do you measure that? Is that $1 more or $1,000 more? However, if you say you want $1 million more then you can measure exactly how close you are to reaching your goal. I also believe that having a very specific goal can provide you with that extra little incentive when things are tough and not looking so bright. Chances are if you have set yourself goals like ‘more’ you’ll quit or accept far less than what you really want to achieve. However, if you have a very specific goal it provides focus and generally provides a greater drive to achieve simply because it is far more real. That little extra push through the tough time is generally what separates those who succeed and those who don’t. It is such a tiny thing but it makes such a world of difference. You can have as many goals as you want but my advice is to make them as specific as you can. Sure, you may not achieve them but I think you’ll be surprised how many you do actually achieve if you make them specific. Have the confidence to go after what you really want and don’t be afraid to be specific. People who do achieve normally have very, very specific goals and don’t forget to constantly measure and adjust as you go along. It is only the unfounded fear of failure that is holding you back. Of course don’t forget to act like a child, a-hem, I mean philosopher at the next social function you attend and ask why? rather than what? Listen to the responds you get to see whether my thumbnail demographics are correct. Getting specific is a small and subtle change but, in my experience, it separates those who do from those who want. I’ve just completed the 74-324 Administering Office 365 for Small Business and I’d thought I’d let people know what it is like. Firstly, I believe it is a much better exam for SMB Resellers to attempt before doing the full 70-321 Deploying Office 365 or 70-323 Administering Office 365. Unlike the 70-321 and 70-323 the exam is much more ‘SMB’ focused. This means that it doesn’t deal as much with the high end enterprise features and combinations of Office 365 environment, especially where it comes to full blown complex hybrid scenarios. SMB Resellers who have worked with Office 365 should be far more comfortable with the questions on offer. That however does not mean the 74-324 exam is easy. Much like SBS exams, to pass you are going to need to know ALL the Office 365 components. You simply can’t skate by just knowing Exchange. The biggest challenge I see for most resellers is going to be SharePoint. The SharePoint questions I found to focus more on the core features of SharePoint rather than some of the high end enterprise features but you will still need to know SharePoint well. I did find it important that you have a good knowledge of the rights and roles in Office 365. Especially, what each role bestowed on the holder. This can become some what complex when you mix Office 365 Administration, Exchange Online, SharePoint Online and Lync Online rights together. My advice is that you need to spend the time mapping all these out and understanding exactly what power each has. In some ways this exam is more difficult than SBS exams because with SBS the best answer is normally to use a wizard. This is not the case with Office 365, so it is kind of like SBS without the wizards. You’ll need to know how to create users and assign them rights for all the services. However, if you work with the product that shouldn’t be too tough. Importantly, you are going to need to know some basic Powershell commands. You won’t need to know the breadth or depth you would for the other exams but you will need to know then. Again, if you have been working intelligently with Office 365 you should be very familiar and comfortable with Powershell but make sure you do some review before you attempt the exam. So, all in all I think this is a fair exam to test Office 365 knowledge for SMB administrators. To pass you are going to need to know each product in some depth, you are going to understand assigning rights, Powershell and some elements of co-existence and hybrid set ups. However, you will not need to focus on the advanced features of Office 365 as you did with the other exams. Most importantly, the exam will challenge most SMB resellers so don’t take it lightly. Ensure you work your way through the Jumpstart for Office 365 SMB videos and then do some practice questions. Like all Microsoft exams, when you are actually taking the test, read ALL of question TWICE and eliminate the options that don’t make sense first. Simply have general knowledge that is convey by the Jumpstart for Office 365 SMB videos is NOT enough to pass this exam. You REALLY need to do a range of typical questions to give a feel for what is likely to be asked during the exam. If you have worked with Office 365 for about 6 months, watch the Jumpstart videos, do 8-10 hours study and then some preparation questions I’d be very confident that you’d pass. However, as I said this exam is tougher than any SBS exam you may have done so don’t approach it lightly if you want to pass! Workspace is a really simple to setup and use product that can provide real productivity benefits and even better provides resellers with an opportunity to introduce client to the productivity benefits of ‘sharing’ information rather than locking it away in emails. Remember if you want to be a guest please contact me directly (director@ciaops.com). Last year, when I attended the SharePoint Conference I came across the Sharegate product. 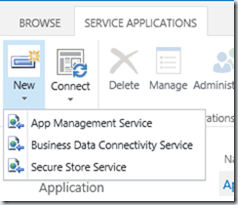 It is basically a tool that allows you to move SharePoint data. I purchased a license shortly after that but I have also been provided a license as an Office 365 MVP (full disclosure). Hopefully you know that you can drag and drop files into SharePoint using Windows Explorer. That works fine if you don’t want to copy any history, versions or meta data, which increasingly people do want. File data is however, only a small part of information saved in SharePoint these days. Most sites have significant amounts of lists. So how can you copy or migrate these? The best way was to export to a desktop application like Excel or Access, there was always the option to save the list as a template and then copy it across and import it into the new location. In short, all very messy. The problem has been, especially in the SMB space, has been the lack of a single tool to handle all this sort of migration and do so at a reasonable price. That was until Sharegate came along. Since I first started using the product it has added a variety of features, now including the ability to content from one site to another. Best of all the product is compatible with all current versions of SharePoint including SharePoint Online with Office 365. You can see from the above diagram that the application is well laid out and easy to use. I like the fact that it remembers your sites and many of your actions so you don’t have to go through the whole configuration process over and over. I like how it also allows you to determine what level of interaction and notification you desire. Great for set and forget migrations. 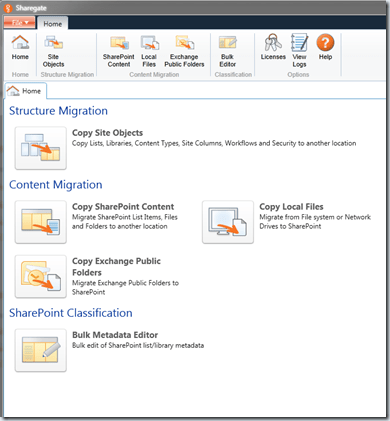 I think that if you are regularly moving SharePoint information whether within sites or with migrations when Sharegate is an indispensible tool. As the above image shows, SharePoint Designer 2013 only works with SharePoint 2013 sites much like SharePoint Designer 2010 before it. Now that I have SharePoint Foundation 2013 installed a member server I thought that I start looking at how well search works and in anything needs to be done to index third party documents like PDFs. What I found so far hasn’t been good news I am afraid to report. Let me set the scene. I installed SharePoint Foundation 2013 on a member server and used the Complete installation method with the data residing on SQL Server 2012 Express. 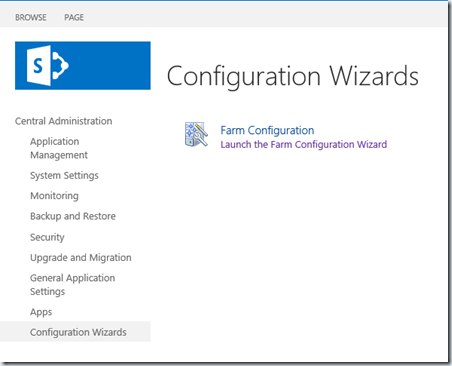 I used the SharePoint Configuration Wizard to set up the site using the defaults. With SharePoint Foundation 2012 it turns out that search is now more like the old Search Server Express 2010. Thus, think of SharePoint Foundation 2013 as SharePoint Foundation merged with Search Server Express. You would think that is good wouldn’t you? 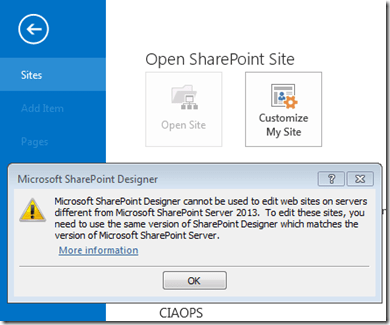 Local SharePoint Servers are a content source but there is no crawl enabled on these sites by default. Easy enough to enable some crawl rules. However, with that done I found that the indexing commences but remain stuck in the Starting state as shown. And here it stayed no matter what I tried or how long I waited. When I attempt to do a search I get this every time. My expectation is that out of the box, using a default installation that search would be enabled and would operate. I certainly not found that to be the case in my experience. As I said, I have tried reinstalling and reconfiguring in a number of different ways and have still had no luck. I’m continuing to try and get to the bottom of why search on Foundation 2010 does seem to work. More updates soon. Visit the SharePoint Central administration site and select Configuration Wizards from the Quick Launch Menu on the left hand side. Press the Start the Wizard button. Select the account you wish to use for this service. It is always better to have one already created than try and create a new one on the fly here. If you want just the Search Service Application then uncheck everything else and press the Next button. SharePoint will bring out the traffic cones briefly while the service is configured. 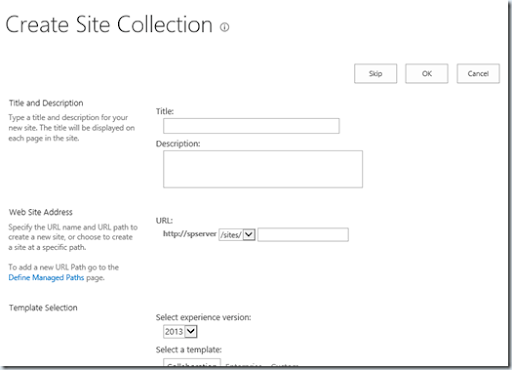 You’ll then be asked to create a Site Collection, but since one has normally be created previously during the manual creation of SharePoint Foundation 2013, press the Skip button. 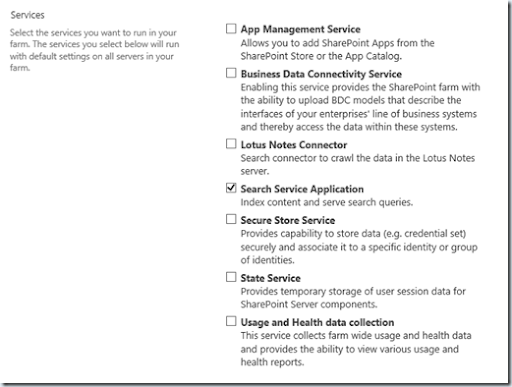 Where you should now see that the SharePoint Server Search (at the bottom of the screen shot above) is now Started! 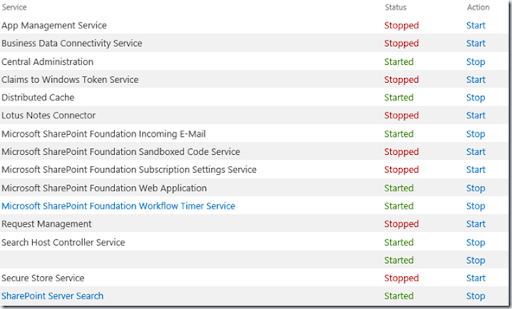 Phew, that is a lot of work if you want to configure SharePoint Foundation 2013 manually! What it tells me is that you are actually better off, if doing a Complete installation, using the SharePoint Configuration Wizard to install and configure all the Services for SharePoint Foundation 2013 (which has always sort of been against best practice). The next question is how does Search work and what needs to be done to get PDF indexing working? Once I work all this out I’ll post it up here. The recommended method of installing SharePoint is not to use the SharePoint Configuration Wizards but to do everything manually. Unfortunately, it doesn’t seem to be that easy any more. Here’s an example I have come across. 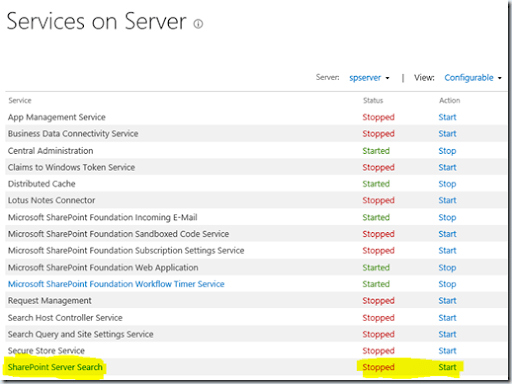 If you then look at Manage Services on this Server you see that the SharePoint Server Search is Stopped. Logically, you press the Start hyperlink to be greeted by the following message. So how the hell do you add the Search Application??? I reckon you may only now be able to do it via PowerShell. I’ll do some digging and report back, however it once again highlights to me how more difficult SharePoint on premise is with 2013.